Fall is in the air. Pumpkin spice everything has appeared. The leaves are changing colors. And we are moving from outside dinners on the deck, back inside around the dining room table. I got some new kitchenware pieces from Kitchen Stuff Plus recently and put together a really simple, beautiful table. 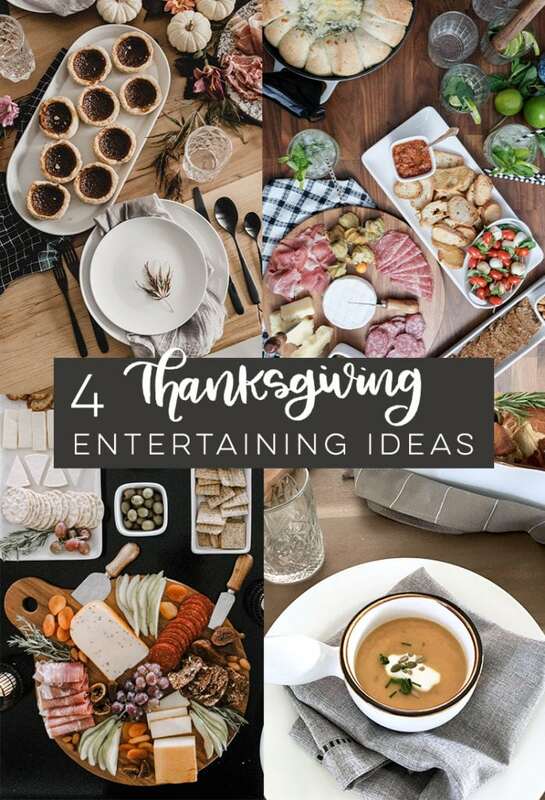 If you need some easy thanksgiving table decorations, this is it! 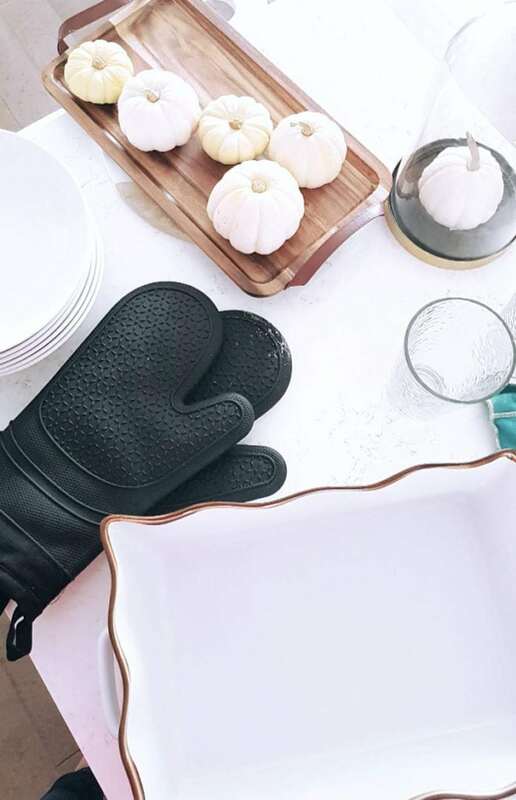 Get your thanksgiving table looking amazing for guests in 10 minutes flat. 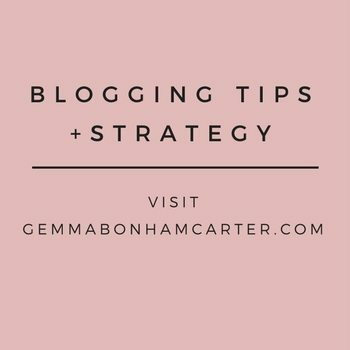 Keep reading for the how-to! White plates and bowls. You can’t go wrong with having a stack of white plates and bowls. They will never go out of style. For this setup, I used the KSP A La Carte ‘Ashford Coupe’ pasta bowls and dinner plates. Glassware. I have this set of ‘Libbey’ drinking glasses and LOVE them. They are nice and heavy glass, and the perfect size. Pair them with some classic wine glasses. Oh and a nice glass jug for your water. Cutlery. Use what you have! I have had this gorgeous gold and black cutlery set in my shopping cart for ages. SO pretty. Kraft Paper Roll. Use this for your table, kids crafts, and wrapping paper! Seriously multi-use. Greenery. I used some Silk Lamb’s Ear leaf sprays that I LOVE. So pretty! Wooden Cutting Boards. I have this acacia wood board that I adore, and this one with leather handles. Napkins. I like classic white. I used these ‘Harman Hemstitch’ napkins from Kitchen Stuff Plus. Serving Dishes. I’m obsessed with any oven-to-table type of serving dishes. I grabbed this ‘Toscana’ bakeware dish that is so easy to use AND pretty, and one of these beautiful matching pie dishes, which is great for dessert. 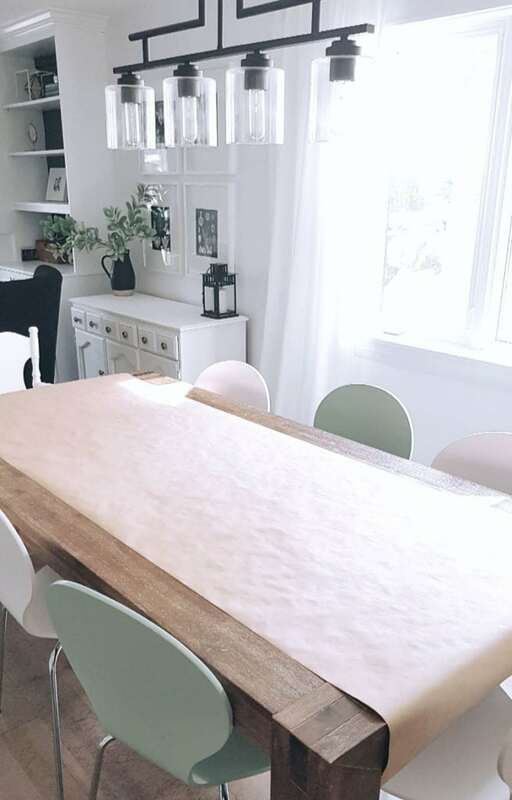 I love to use brown kraft paper as the base of my thanksgiving table. Not only does it look great, but it can do double-duty as kids’ entertainment during dinner if you put out a little cup of crayons! Plus it makes clean-up way easier. Just pop it into the recycling! Pull out your dishware and accessories at this point. I find it helpful to lay it all out on my kitchen counter so I can see everything in one spot. 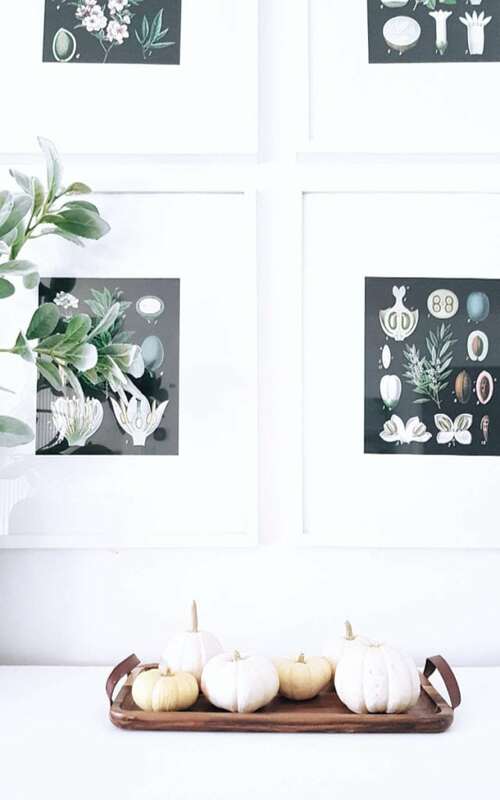 Steal decorative accessories from other parts of your house. This acacia wooden tray for example is usually in our bedroom, but I knew I could incorporate it into the tablescape. That big white dish is from the Toscana oven-to-table bakeware line that I’m obsessed with. You can prep your main in there and serve it right on the table in that beauty. I usually lay out all of my dishes, napkins, cutlery and glassware to start. That might be backwards from what other people do, but I like to know that all of that stuff is going to fit before I do anything down the middle. Honestly classic wins every time. White plate + white bowl + white napkins (not paper!) + cutlery + glassware. 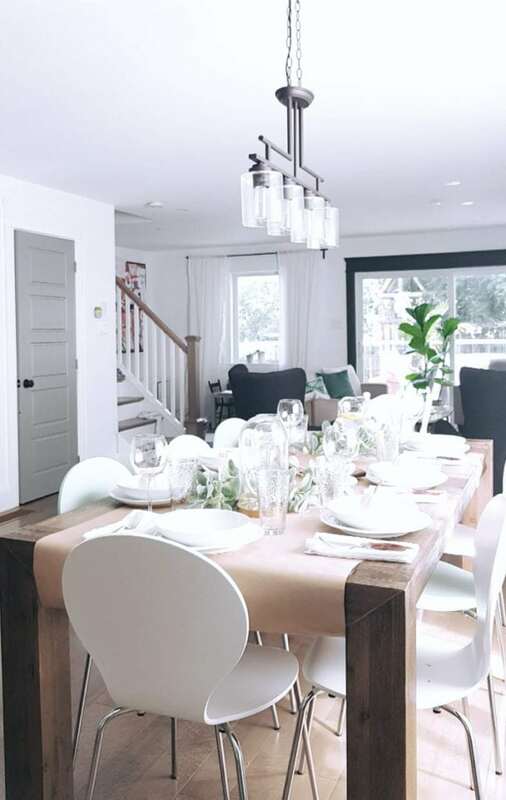 You can mix and match what you use as a centerpiece, but use these same pieces for years and years because they just won’t go out of style. I really am loving the Ashford Coupe set of dishes from Kitchen Stuff Plus you see here. 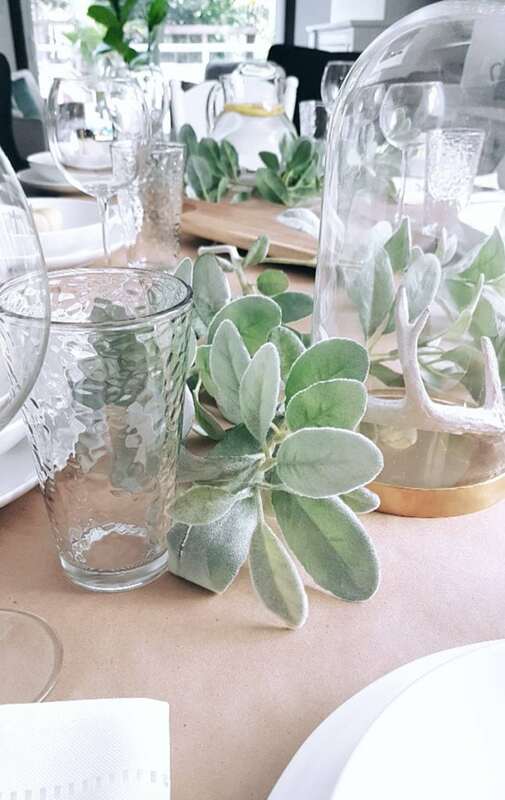 Then take your any greenery stems you have – I used a silk lamb’s ear leaf spray – and lay it down the middle of the table. Then pop your cutting boards and serving dishes just anywhere along the center too, overlapping the greenery in some spots. Then just add in some fun accessories into the mix. 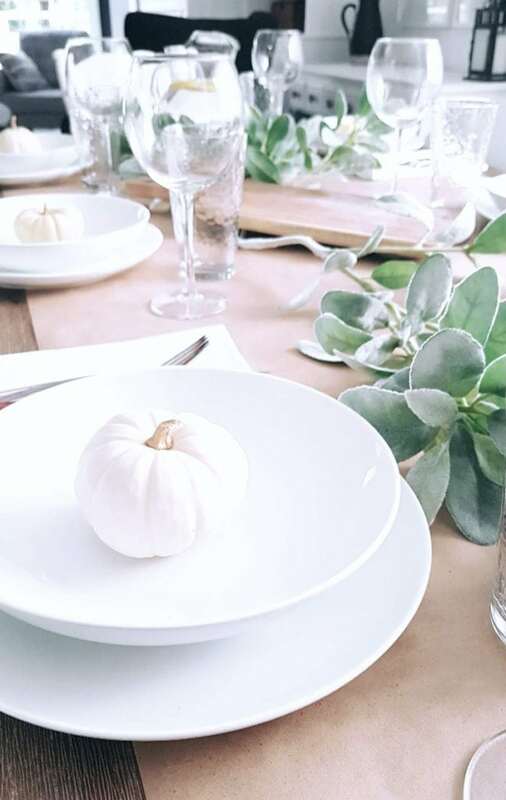 The little pumpkins on plates or bowls is such an easy and cute decorating trick. Throw in some candlesticks. A glass cloche. Anything! Put some water in a nice glass jug (this is the one I have!) with some sliced lemons, and it even serves as decor. The result is really simple, classic and totally Pinterest-worthy. Your family and friends will think you really went to town decorating, but actually you’ll know that it took all of 10 minutes. If you snag some extra little pumpkins, dot them around the house. They add such a nice little touch of Fall. And that’s it. 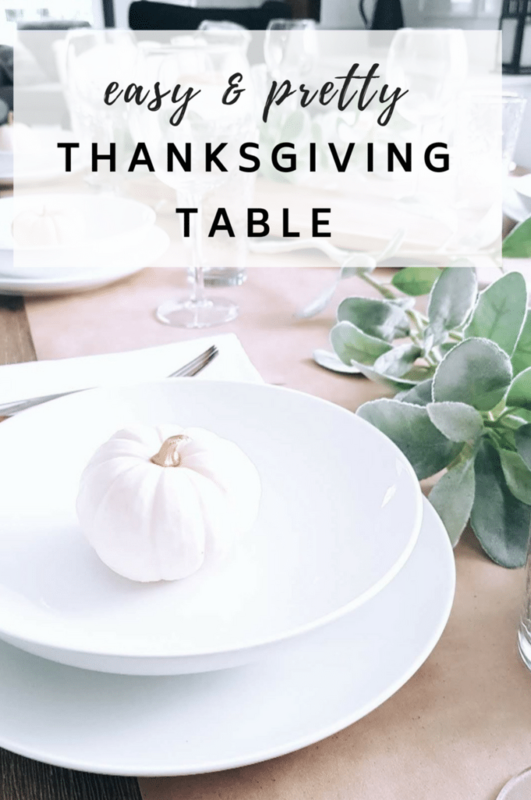 A classic and pretty Thanksgiving table that I promise, ANYBODY can re-create. 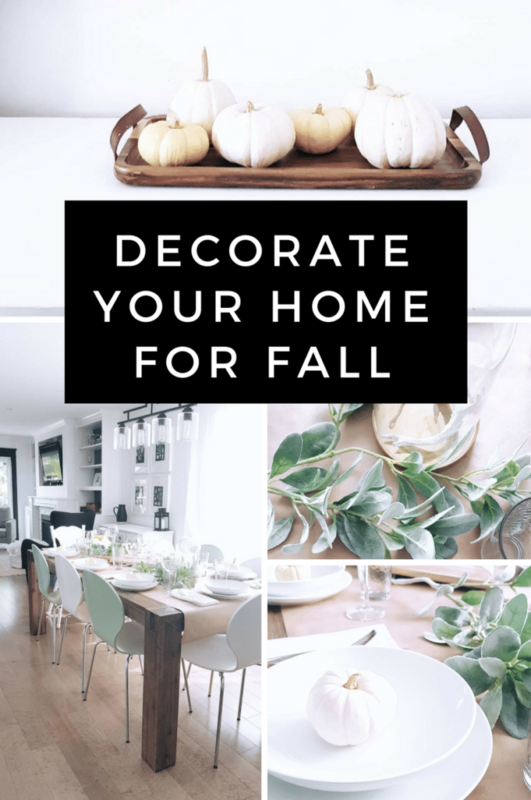 If you want more Fall decorating, make sure to head over to My Top 10 Fall items from Etsy! Head on over to check out what the rest of the gals did this month with the Modern Handmade Home Series. 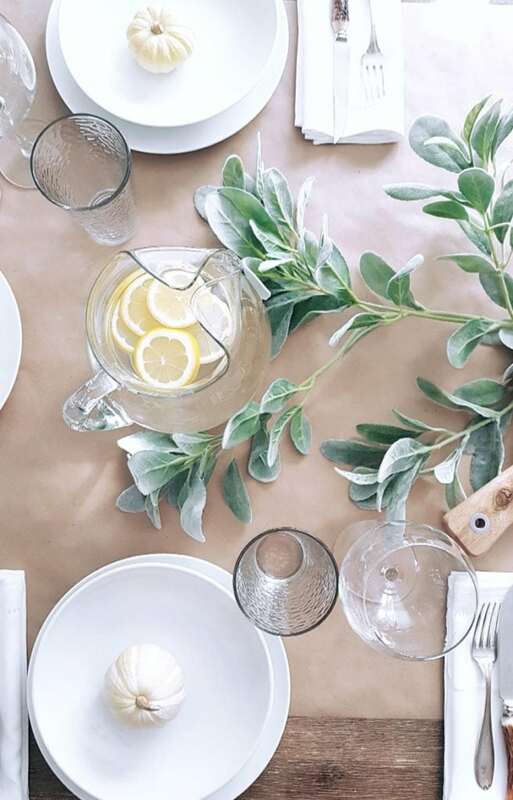 Some more beautiful tablescape ideas, all using products from Kitchen Stuff Plus! Disclaimer: This post was sponsored by Kitchen Stuff Plus. 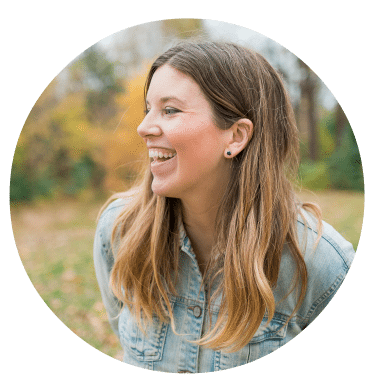 Thanks for supporting the amazing brands that we love to work with here on the blog!